Driving on a wintry highway with my girlfriend asleep in the passenger seat, I took my hands off the wheel. The vehicle approached the right lane marker. Suddenly, the steering wheel turned itself to bring us back into our lane. I let the vehicle keep going steadily to the opposite lane marker. The wheel gently jerked us back in the opposite direction. This lane-keeping technology, is one of many useful technologies Fiat Chrysler put into the 2016 Jeep Cherokee Trailhawk Edition. Technologically-enhanced highway cruising might not fit the traditional Jeep mode, but the prototypical SUV has evolved mightily under the hood. So has its shape. The instantly recognizable (to car fanatics, anyway) Jeep “waterfall” grill, once the hallmark of a vertical front end, gets bent over a gently sloping hood. The headlights are narrow slits that wrap around to the sides. Two sets of fog lights sit just below. The Eco Green Pearl paint job gives way to black side panels on the lower portions of the body. These are punctuated by red metal hooks, two in front, one at the rear. Fortunately, the windows don’t narrow much from the front of the vehicle to the back (this isn’t the boxy Jeep design of old, though you can still get that too), but as with all SUVs, the rearview camera makes a big difference. There’s a matte black element on the hood of the Jeep. A cosmetic feature exclusive to the Trailhawk model, it reduces glare coming off the hood. 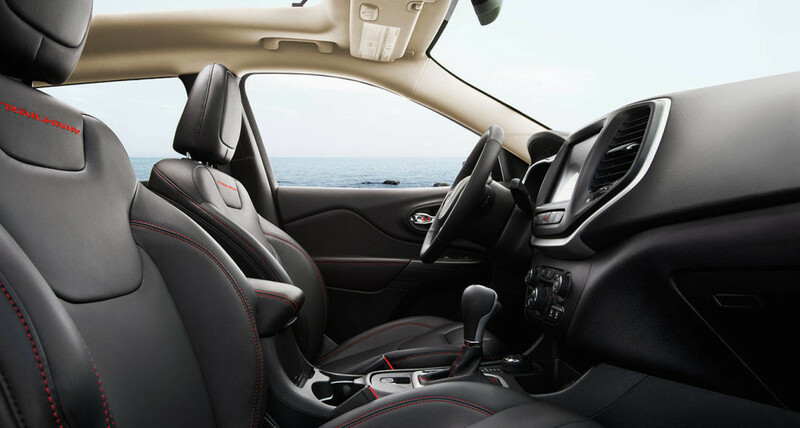 My tester shipped with a black interior, subtly punctuated here and there by red stitching. The rear seat is blessedly roomy even for taller passengers. This vehicle will swallow all sorts of gear without the back seats going down. 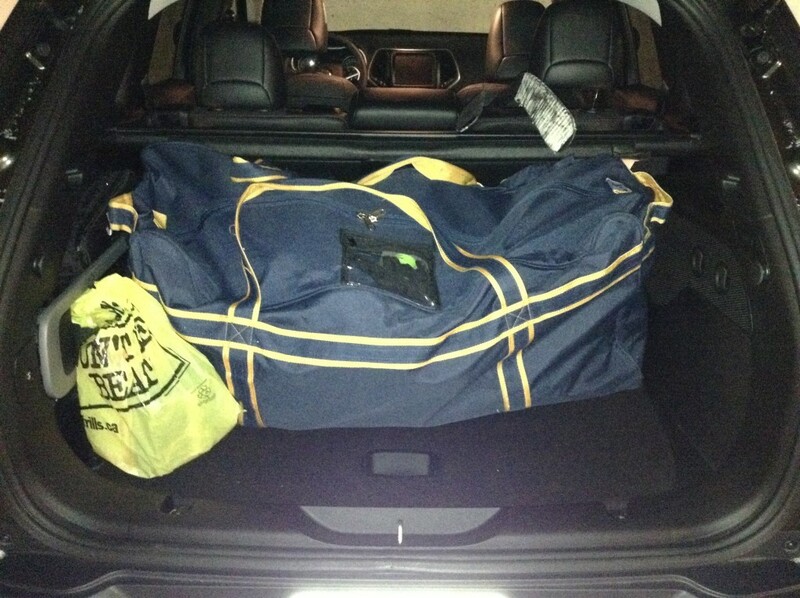 The power liftgate goes up so high I didn’t need to stoop while putting gear inside. Just be careful opening the liftgate while indoors – it reaches up pretty high. A few inches separated the liftgate from the ceiling of my condo parking garage, something I noticed only after the hatch was open. It certainly would have made contact if the spare tire was mounted on the liftgate in traditional Jeep fashion, and not under the trunk floor. 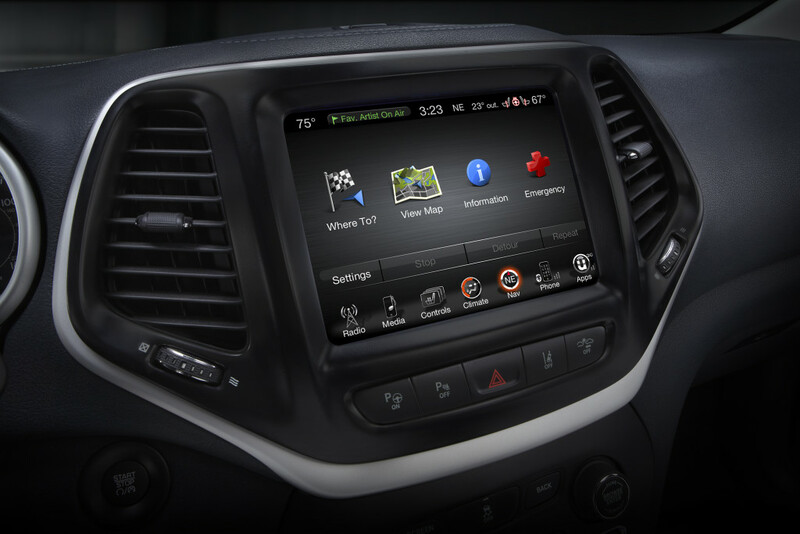 Fiat Chrysler’s Uconnect system comes to the driver via a generous 8.4” touchscreen that sits high up between the driver and passenger. Large, easy-to-read icons await their fingers. Music from my iPod played easily, but I had to fiddle with the system to get audio from a 3rd-party app I use to play audiobooks (Overdrive). I finally settled on the following three-step sequence: mute volume, unmute volume, adjust volume. As much as Chrysler has refined Uconnect – and there’s a lot of refinement here – those pesky third-party apps are best curated and handled by the companies that make mobile operating systems (i.e. Apple and Google). For now, Uconnect “curates” several streaming music services. I wouldn’t expect Chrysler to manage more apps, since there are far too many that could legitimately be used (and controlled from a touchscreen) for Chrysler to keep up with, and more apps hit the market all the time. Better to let the makers of mobile device operating systems (Apple and Google, most notably) selectively enable apps for use with Carplay or Android Auto, respectively. They already curate mobile apps, so why should Fiat Chrysler (and other automakers) do redundant work? With any luck, I’ll get to try the still-rare Apple CarPlay and Android Auto later this year. Physical connections include readers for USB memory sticks, SD cards, and an audio input jack. The USB port will charge the battery of your device. Charging your mobile device becomes easier when you opt for a wireless charging pad, presuming your device meets the Qi magnetic induction charging standard. The Jeep also features three 12-volt outlets. The Driver Information Display (DID) is the screen that sits between the speedometer and tachometer on the instrument panel. The driver scrolls through various sets of options using controls mounted on the left side of the steering wheel. Fiat Chrysler has devised the coolest steering-wheel-mounted audio control switches of any automaker, simply by hiding them behind the wheel. The driver feels them when they hold the wheel at the 9 and 3 positions. My tester sported a 3.2-liter 24-valve V6. This powerplant gives you all the power you need to move nimbly on the highway. Under the right conditions, the Start-Stop system also turns the engine off when you stop the Jeep, cutting this big engine’s gas consumption. Take your foot off the gas and the engine fires up right away. 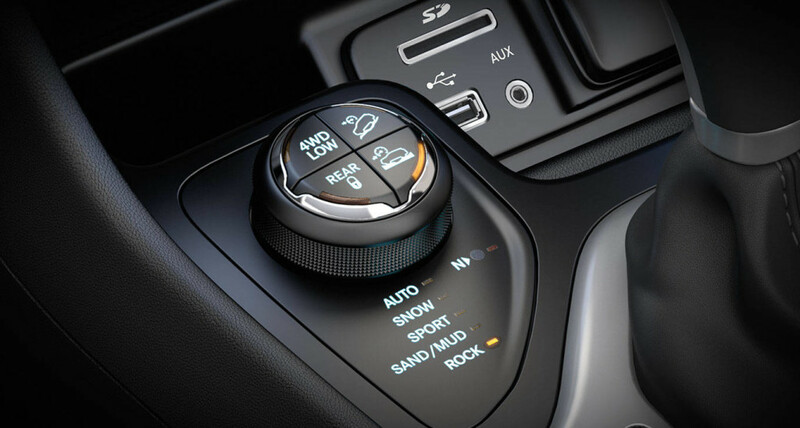 The Jeep’s 9-speed transmission contributes to both effective power transmission and fuel savings. A dial containing buttons sits just ahead of the shift lever. This is where you’ll find the various drive modes people have come to expect from Jeeps. Fiat Chrysler calls this group of controls Selec-Terrain. Twist the dial to engage Sport mode and enjoy more aggressive driving (something I wasn’t going to do on winter roads). Rock mode calibrates the vehicle for high-traction off-roading, while Sand/Mud mode is designed for low-traction off-road driving. I didn’t need to cycle through these options, but I did enjoy other driving technologies. Adaptive cruise control (ACC) kept the Jeep well back of vehicles ahead of me on the highway, even adjusting distance when a vehicle cut between me and the vehicle I was originally following. It only turns on at highway speeds, but I continued to let ACC slow the Jeep down and speed it up when we approached stop-and-go traffic caused by an intersection at the end of a highway. The starts were fine but the stops a little bit too jarring for my taste. (My taste? I use engine breaking on my regular vehicle, a five-speed that lets me sometimes come to a full stop without even touching the brake pedal.) My girlfriend woke up, by the way, at the approach to this intersection. One other thing struck me as odd: I learned to leave a two-second cushion between myself and the vehicle ahead. To achieve that cushion using the Jeep’s ACC, I had to set it to maximum distance (four bars out of four). Given the active safety nature of this technology, I was surprised to learn that it enabled following any more closely than this. Parksense Active Park Assist helps guide drivers into parking spots, while LaneSense (the technology I described at the beginning of this review) warns drivers if they drift out of a lane using “haptic feedback” in the steering wheel. In layman’s terms, the Jeep gives the wheel a twist to keep itself in the lane. It even worked when the highway turned gently in one direction, keeping the Jeep calmly in its lane with repeated twists of the wheel in the same direction. It’s nicer than a warning beep, and just as effective. Does combining LaneSense and ACC make the Jeep self-driving on the highway? Nope. If you approach lane markers at too sharp an angle, the Jeep will beep at you and the haptic feedback might not happen. (I didn’t test this possibility.) 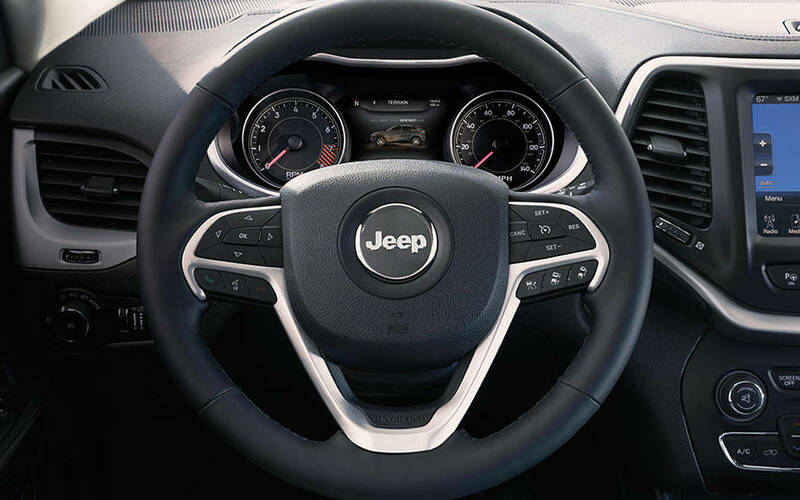 While testing LaneSense, I let my hands hover over the wheel, but the Jeep would have none of that silliness – it admonished me via the DID to keep my hands on the wheel. Finally, LaneSense only works if the Trailhawk can detect lane markers. In other words, it isn’t guaranteed to work in every driving situation. The Trailhawk’s sensors also enable a Forward Collision Warning for anybody foolish enough to disregard what I wrote in the preceding paragraph. The Trailhawk, outfitted with the 3.2-litre engine, posts 12.2 litres/100 kilometres in the city, 9 highway and 10.9 combined, acceptable numbers for a full-sized SUV. Bring up the fuel economy screen on the instrument panel and you’ll see the Jeep reward calm driving behaviour. I momentarily achieved numbers far lower than those above by stepping off the accelerator well in advance of red lights and driving on downward-sloping roads. The aforementioned Start/Stop system also helps to limit gas consumption. The Trailhawk takes 87 octane fuel in its 60-litre tank. 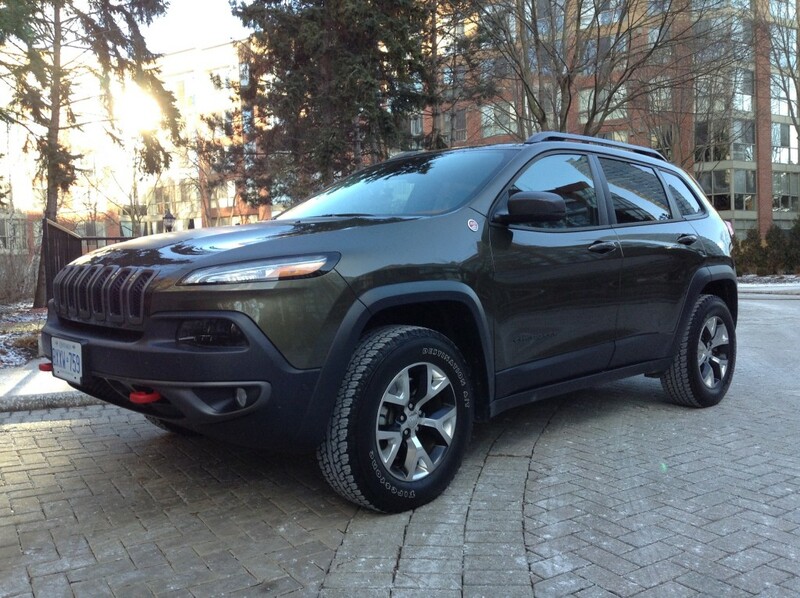 The 2016 Jeep Cherokee Trailhawk starts at $33,695 MSRP. As tested, that jumps to $42,832. Every successful product evolves if it sticks around long enough, and the Trailhawk proves Jeep is no exception. It sports technology undreamed of in its original World War Two configuration, but I suspect drivers back then would appreciate how much more capable this iconic rambler has become.